Apple showed off the Apple Watch last month; they were the first company to really figure out smartphones, they were the first company to really figure out tablets, so are they going to do the same with smart watches? And, if so, what does that mean? We’re obviously quite some distance away from knowing the answer to that, but still, I’m really curious what’s going on here. 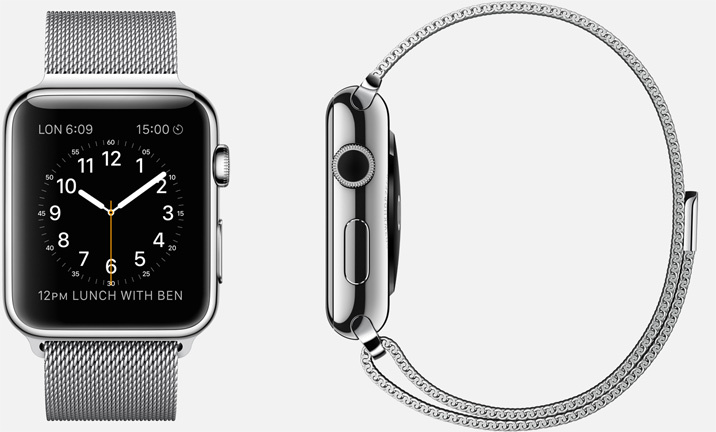 The obvious part of the watch story is: it extends their range of screen sizes. Which makes sense on its own, but it’s particularly interesting right now after the iPhone size increase: even with an iPhone 6 I’m noticing that I use my iPad at home significantly less than I had been, and the iPhone 6 Plus is surely going to eat significantly into iPad Mini sales. But the 6 Plus is also too large to fit into most people’s pockets; and, as my daughter frequently reminds me, even the smaller phone models are too large to fit into the pockets of half the people on the planet. So there’s definitely room for a smaller screen that’s always accessible. What I’m not sure is to what extent having a clear job to be done matters. Or rather: I’m sure that it does matter, having a compelling story and vision is one of the reasons why Apple’s entries into product categories are so much more effective than other companies’ entries. And maybe the lack of a compelling story is part of the reason why the iPad has stagnated? But the flip side is: Apple’s iPhone event told a great story about being a great iPod, a great phone, and a great web browser, but that’s not where I spend most of my time on my iPhone these days, and in fact I almost never use those first two pieces of functionality. Instead, there are a handful of super compelling apps that I use, which the original iPhone didn’t even allow! So maybe predicting the jobs to be done in advance isn’t what’s so important. What’s important instead is perhaps coming up with a few good interaction models, coming up with some examples of how to use those interaction models, and then watching what other people do with them? And the watch does have a couple of interesting interaction methods, I suspect Apple will do a good job of providing apps that show users and developers what’s possible with those interaction methods, and hopefully the app store will do the rest. And opening up possibilities for third-party developers is something where 2014 Apple is on fire: this year’s WWDC was super exciting with the range of technologies introduced, with them bringing those technologies to both iOS and OSX whenever that made sense, with a significantly increased ease of communication both between applications and between devices, and a whole new programming language to build on. So tools are there for developers: and in particular tools for communication between different classes of devices are going to be very important for the Apple Watch, especially on early cell-less models. I have no idea what will blow me away on the watch the way Tweetie did on the iPhone, but I have a lot of confidence in both the developers and the tools. But the announcement interests me more because of the context it puts the Apple Watch in: the announcement puts the Watch in a watch context and in a fashion context. A lot of the tech press coverage seemed bemused my the amount of time the presentation spent on the watchiness of the Watch, in particular on the astronomy-focused watch face. But I like the respect that shows for tradition: if you’re entering an arena whose roots go back thousands of years, then why not make a nod to that history? It’s a welcome counterweight to the Silicon Valley tech arrogance that thinks that we can march in anywhere and show people how to do things: let’s acknowledge that we’re working in a context, and that that context has value. And the fashion context of the watch is even more interesting. Again, returning to Silicon Valley norms: we’ll look up our noses at conventional versions of fashion, you’ll do better in an interview if you’re wearing a scruffy t-shirt and jeans than if you’re wearing clothing that sends an overt signal that you spend time focusing on your choice of attire. (And pity the programmer who shows up at a job interview wearing a suit or wearing makeup and perfume.) This is, of course, fashion as well, and it has the potential to be a particularly oppressive one: not fashion as self-expression but fashion as insistence on avoidance of certain types of self-expression or signaling. Apple’s been in an interesting position here. They clearly care a lot about the design of their objects in all senses: how it feels to use them, to look at them, to touch them, and yes, to be seen with them. The iPhone 4 was amazing to feel, I love the curves around the edges of the iPhone 6, the MacBook Air and recent MacBook Pros have been gloriously thin, and I still have fond memories of the second generation iPod Nano. But Apple’s small product line, their remarkable hegemony, and the desire to always buy the most recent version for purely technical reasons combine to mean that you don’t have a lot of choices compared to any healthy fashion environment. They’ve taken some steps in that direction. Going back a bit, the original iMac came in a range of colors; they’ve generally stepped away from that in their computers (though I wouldn’t be surprised at all if color choices start reappearing), but they had a decent range of color options in their cheaper iPods, they added color choices last year to their cheaper iPhones, and they’ve started expanding the range of color options in their more expensive iPhones as well. And, moving beyond color, you’ve been able to purchase iPods in a lot of shapes and sizes over the years, again with more experimentation on the cheaper range of the line. I get the impression that Apple is now much more willing to produce a range of options for similar devices than they have been in the past; I’m not sure why, maybe it’s simply an issue of focusing on that sort of choice, maybe they’re now more confident in their ability to forecast demand, maybe they have short enough manufacturing cycles to be able to respond to unexpanded demand? 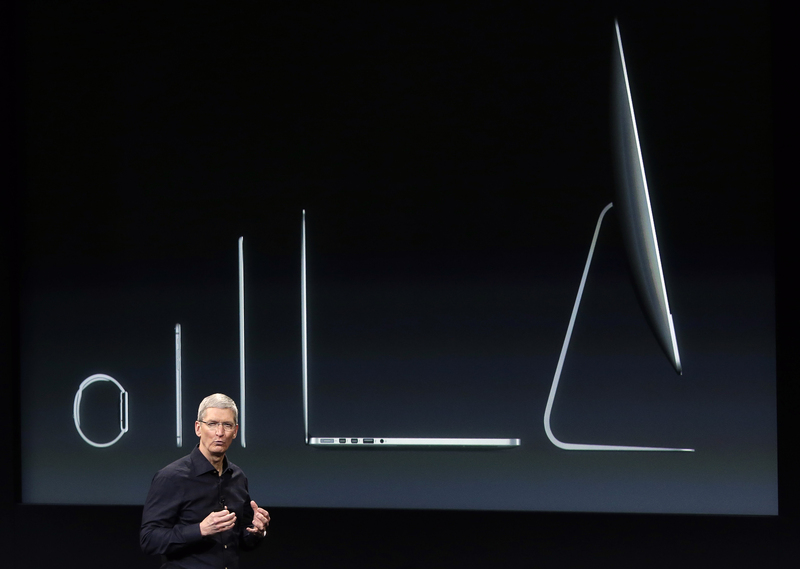 Still, there are limits to the amount of styling choice that Apple allows. Part of that comes down to the very nature of the iPhone: by its nature, one side of the device is going to be dominated by a big piece of glass. 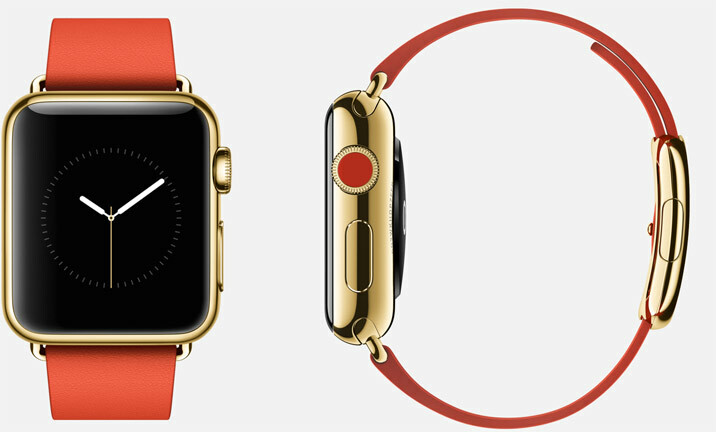 And the watch suffers from the same problem: the display is important, the display is also featureless. (At least if it’s turned off: both devices, when turned on, can be personalized much more than a traditional physical device!) But part of that is Apple’s opinionated nature. Like I said, though, I think that aspect of Apple’s nature is changing: they’re not going all grab bag, but they’re producing a wider range of options. That certainly is the case with the watch: they’ve never launched a product line with that number of choices. Which works well with the nature of a watch: it’s out there on your body for you and other people to see (instead of being hidden in your pocket most of the time), and the strap is much more visible than the back of a phone is. So: lots of choices, compared to the norm for Apple products. And not just choices of colors, which we’ve seen on a few different product lines of theirs, but the different straps differ substantially in materials, in design, even going down to the level of how the wristbands close. Still: $10,000 sounds like a lot of dollars to me, too, especially for an item with such a short lifespan. I don’t actually expect the Edition models to be that expensive, but I’m also sure that the Edition models will be priced such that I’m extremely unlikely to get one. But I do wonder if there’s a way to soften that blow. As I said above: one of the reason why Apple has such a limited range of designs is that there’s only one or two designs available for a given device at any given point in time. But, over time, designs can differ quite a bit more: look at all the different versions of the iPod Nano or iPod Shuffle, for example. So I still think the second generation iPod Nano or the iPhone 4 look great; unfortunately, that doesn’t translate into a range of currently viable options, because I wouldn’t want to buy a new phone with years-old technology. With the watch, though, I think the story might be a little different: the fact that it has to fit on your wrist means that we won’t see iPod Nano / iPod Shuffle levels of form-factor experimentation, and it might even guard against the size bloat that we’ve seen on the phones. So I expect the primary functional differentiating factor over generations of watches to be the electronics inside, with perhaps the quality of the screen and sensors a secondary differentiating factor. 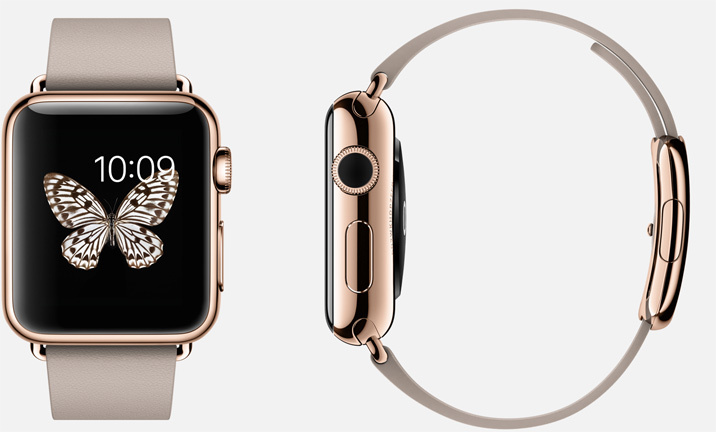 If the watches are upgradable, suddenly high prices make more sense. They make more sense from a value-for-the-price point of view, but they also emphasize the quality and fashion stories that the expensive models are telling. I imagine Apple will sell only a limited number of styles in any given year, but I also imagine that those styles will change significantly every two years or so, at least at the beginning. That means that there will be people who say “the Apple Watch 3 was the best-looking model” and who want to hold on to theirs for years or will be willing to spend quite a lot of money to buy a second-hand one once they’re no longer available. I doubt that that would be enough to convince me to buy an Edition watch (though who knows, I’d probably consider it the next time I’m at a startup that gets bought, the Rose Gold version and the Gold and Red versions of the watch are gorgeous), but upgradeability combined with the styling of the stainless steel and the Milanese loop would be enough to push me into buying the regular model over either buying the Sport model or not buying a watch at all. I’m not at all sure that the watch is going to be upgradable: that would be quite a constraint for Apple to put themselves under, and maybe just having the bands work across generations (which I’m pretty sure will be the case) will be enough of a nod towards longevity, given that the bands are the most visible part of the devices’ style? But the Apple Watch does seem like it could be an interesting step from computers as functional, transient objects towards computers as objects that are integrated into the richness of our lives. Ben Thompson has had a bunch: the podcast episode I mentioned above, a follow-up where he walks some of that back (but his cohost disagrees), and two written posts talking more about how and why he changed his mind. John Gruber had my single favorite post on the watch plus a podcast episode with Ben Thompson. Benjamin Clymer of Hodinkee gives a watch guy’s point of view. I like how Benedict Evans put it in context. Horace Dediu contrasts the original envisioned jobs to be done from the subsequent actual jobs to be done. Rands talks about the diversity of options. The Accidental Tech folks argue about the watch in a reasonably entertaining / informative manner. They also bring up the question of how the Edition watch will be sold, given that current Apple stores are too crowded to be a good luxury experience.